Posted on November 19, 2010 by Corvid Gyrl2 Comments on Steller’s Jay eat deer! 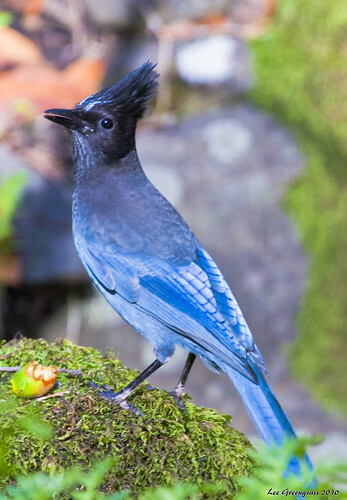 Steller’s Jay, originally uploaded by pandatub. “a Steller’s Jay latched onto the side of the carcass as if it were some kind of a giant suet feeder. That jay was sent packing but more jays were now posted on either side of the garage and weren’t shy about entering if no one was around. [One guy] added a little extra fencing on the doors, hoping to put an end to the intrusions, but the birds were persistent and willing to fly through fairly small gaps. 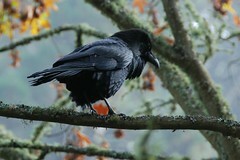 I know the crows and Steller’s Jays I feed prefer peanuts over bread, raw beef, and bird seeds. So, maybe it is a matter of survival — eat whatever is available but if given some leeway, they will choose by taste. Today, I decided to introduce the Fan-tailed Raven officially known as the Corvus rhipidurus. This corvid is native to Eastern Africa and the Arabian Peninsula. It is much smaller than most other corvids at around 18 inches long. It has a thick bill, short tail and large wings. It looks thinner than the Common Raven and is completely black with a purplish-blue gloss in the right lighting. If it is an older Fan-tailed Raven it can appear slightly coppery-brown. Their voice is described as guttural croaks mixed with the sound of frog-call. It lives in desert or open dry country that includes crags for nesting. It is one of the most aerial of birds traveling huge distances in search of food, its large wings being adapted to gliding on thermals in a rather vulture-like way. 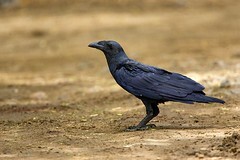 The Fan-tailed Raven eats insects, invertebrates, grains taken from other animal’s dung, human food scraps, parasites of other animals and garbage. It will also eat a variety of fruit. I like this bird. It is interesting, too bad I live so far from it. Does anyone you know or do you live near it? Have any stories you wish to tell? They are omnivorous…meaning they will eat just about anything. This helps them survive and thrive. They are intelligent birds and beautiful. This is why they are so popular. There are poems about them, songs, stories, folklore, and obviously a lot of art. Let us know (See below). Let me end this with the very famous, very loved “The Raven” by Edgar Allen Poe. Only this and nothing more». This it is and nothing more». But the fact is, I was napping, and so gently you came rapping. «Tis the wind, and nothing more». With such name as «Nevermore». Till I scarcely more than muttered, «Other friends have flown before! On this home by horror haunted – tell me truly, I implore? «Be that word our sign of parting, bird or fiend!» I shrieked upstarting. «Get thee back into the tempest and the Night’s Plutonian shore!